Asian Carp in the Great Lakes? This Means War! There are illegal immigrants on the loose in the Midwest. Originally hailing from Asia, they're about 3 ft. (90 cm) long and weigh up to 100 lb. (45 kg), and are known to resist capture. Once they establish residency, they can eat you out of house and home. They're called Asian carp, and they emigrated to the lower reaches of the Mississippi River in the 1970s. Now they're knocking on the door of the Great Lakes, threatening to destroy one of the most valuable aquatic regions in the U.S., unless the often fractious Great Lakes states manage to pull together and keep them out. The situation is so serious that the White House convened an "Asian carp summit" on Monday to work out a defense plan. "If the carp invade the Great Lakes, it will change them forever," says Jennifer Nalbone, director of invasive species and navigation for the NGO Great Lakes United. Asian carp  a collection of related fish, including bighead carp and silver carp  are what's known as an invasive species, an animal or plant that moves into a new environment, often badly disrupting it. Invasive species are becoming more common because of international trade, which turns the planet into a giant pinball machine, transplanting wildlife from one corner of the world to another, and because of climate change, which prompts species to migrate to more hospitable environments, often at the expense of those that already live there. In the U.S., invasive species like the Rocky Mountain pine beetle, which has ravaged trees from Colorado to Montana, cause an estimated $120 billion worth of damage annually. "Invasives take over the habitat that native species need to survive and persist," says Frank Lowenstein, director of the Nature Conservancy's (TNC) Forest Health program and an expert on invasive species. "Eventually invasives just start replacing natives." Asian carp are particularly dangerous. Native to China and parts of Southeast Asia, the freshwater fish have been cultivated for aquaculture for more than 1,000 years, often raised in submerged rice paddies. Catfish farmers in the U.S. imported Asian carp decades ago to eat up the algae in their ponds; the fish slowly escaped into the wild and have been making their way up the Mississippi River. 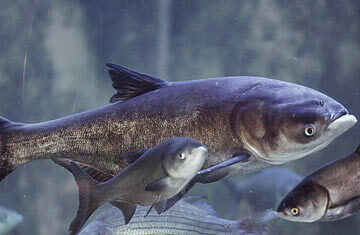 They are eating machines; bighead carp can grow incredibly quickly and reproduce rapidly as well. "They just eat so much," says David Ullrich, executive director of the Great Lakes and St. Lawrence Cities Initiative. "They're like the locusts of the river." That's what makes them so dangerous to the lakes. Asian carp aren't direct predators, but they eat plankton, which knocks out the bottom layers of the food chain. If they were to successfully establish themselves in the Great Lakes and start breeding, they could utterly disrupt the existing ecosystem, potentially starving out the trout and other native fish that make the Great Lakes a tourism hot spot. And if their voracious eating habits weren't enough, silver carp pose a direct threat to boaters. When startled, the fish launch themselves out of the water, turning into 40-lb. (18 kg) projectiles that could easily smash an unwary fisherman's nose. It's enough to turn a fishing trip into something worthy of the X Games, which may be fine for the extreme-angling participants of the wild Redneck Fishing Tournament in Illinois, where silver carp are the target and black eyes sustained from flying fish are a badge of honor. But your average day-tripping sportsman on Lake Michigan might not appreciate an airborne carp smacking him in the kisser. "They are living missiles, and that's not trivial," says David Lodge, director of Notre Dame's Center for Aquatic Conservation. It's not yet certain that Asian carp have made it into the Great Lakes. The Mississippi River system and the Great Lakes are connected only through the man-made Chicago Sanitary and Ship Canal, which leads from Lake Michigan to the Illinois River. (It's not uncommon for invasions to occur when humans connect ecosystems that have naturally been kept separate.) The Army Corps of Engineers put an electric barrier in the canal to prevent the carp from infiltrating Lake Michigan, but it may not have been enough  although no live fish have been found yet, last month a team of scientists discovered Asian carp DNA in Lake Michigan. "That's enough to show that they're likely making their way into the lakes," says Lindsay Chadderton, director of TNC's Great Lakes Aquatic Invasive Species program. Scientists don't know how large the Asian carp population would need to get before it becomes self-sustaining and morphs from nuisance into true threat. And some doubt the fish will ever make it into the lakes, given their need to spawn in long, fast-flowing rivers like the Illinois. "It might be 20 to 25 years before they really establish themselves," says Duane Chapman, a research fish biologist with the U.S. Geological Survey. "We don't know for sure that we'll have any problems to speak of." Maybe, but that's not how the governors of Michigan and Wisconsin are treating the problem. They want the locks of the Chicago canal to be shut down immediately, to prevent the carp from ever gaining a finhold in the Great Lakes. But Illinois lawmakers argue that closing the canal would disrupt hundreds of millions of dollars' worth of shipping. A coalition of six Great Lakes states and the Canadian province of Ontario even sought an injunction last month from the Supreme Court to force an immediate shutdown of the canal; the court declined to issue the ruling but will hear briefs on the subject later this month. The White House has taken action as well. On Monday, federal officials announced $78.5 million in funding to prevent the spread of Asian carp; plans include building new barriers between the Chicago canal and the Des Plaines River. (The carp may be able to bypass the existing electric barrier in the canal when water levels are high and the two waterways mix.) "We see the threat and potential impact of the Asian carp establishing themselves in the Great Lakes," says Nancy Sutley, chair of the White House Council on Environmental Quality. "We believe we have the chance to work together to prevent economic and environmental damage before it occurs." That's an ideal plan, since it's much easier to prevent invasive species from infiltrating a new home than it is to eradicate them after the fact. And any plague of foreign species will likely become harder to quash because of global warming, as nonnative plants and animals are often better able to adjust to changing climates than indigenous species, according to a study published last week in the journal PLoS ONE. "We have to recognize that we are the ones changing the natural world, and we have an obligation to do it responsibly," says TNC's Lowenstein. "Not just for the planet, but for our own sake." If the preventive efforts don't work, you might want to put on a helmet the next time you go waterskiing on Lake Michigan. Download TIME's iPhone and BlackBerry applications.